Not long after the Orange Bowl was played on New Year’s Eve, the Dolphins embarked on an ambitious, $400 million plan to rip apart about one-third of Sun Life Stadium. Dolphins President Tom Garfinkel has been regularly posting photos of the progress. The plan is being carried out in two phases. The first takes off the upper corner sections permanently, leaving the structural raker beams behind. The lower sideline sections are also being removed, to be replaced with new sections that will eventually bring the first row 24 feet closer to the field than before. All of the seats will be replaced with bigger, all-turquoise versions. 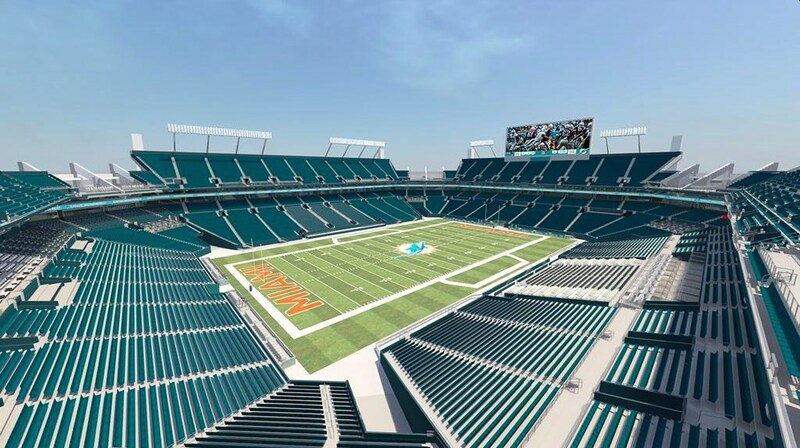 The lower deck renovation will allow the Dolphins to offer new luxury seating types between the usual club seat and suite choices. Some will be mini suites at midfield, others will be behind the end zone. Concourses are also being redone. Second phase improvements include new scoreboards in the upper corners where the seating sections used to be, and the big reason for the project: a huge open air canopy that will cover virtually the entire seating bowl and outdoor concourses. Given the often rainy and hot weather in the first half of the NFL season, this was considered a necessary addition. The canopy is also a must for the NFL if future Super Bowls are to be held there (the last was held in 2010). Final capacity is projected slightly above 65,000, a cut of 10,000 seats. Despite the reduced seat count, the venue is better positioned to bid for the Super Bowl and the College Football Championship game, which is up for bid separately from the normal bowl rotation (the stadium already hosts the Orange Bowl). Most importantly, this project is being financed privately, mostly through luxury seat/suite sales, not through bonds, PSLs, or other unsavory means. Stephen Ross campaigned for public funding for the better part of 2 years, threatening that the Super Bowl wouldn’t come back without yet another South Florida giveaway. He eventually gave up his quest, seeing that it would be better to get started on the project and get the Super Bowl. Finally, Miami-Dade County held firm and wasn’t ripped off the way they were by the Marlins and Heat. In May I covered the much more modest, $200 million renovation at Orlando’s Citrus Bowl. While that project lacked much of the luxury amenities being added to Sun Life, the actual teardown and rebuild was more extensive, gutting and replacing the entire lower bowl. I wondered why the Raiders weren’t pursuing this path at the Coliseum. I can say the same now that the Dolphins are going down a similar, albeit more NFL-appropriate path. A Raiders renovation would be a sort of hybrid of the two, not as swanky as Miami nor as basic as Orlando. Over time I ballparked the cost at $500-600 million, basically the same amount as the funding gap the team and Oakland/Alameda County face at Coliseum City. So why is no one talking about a Coliseum renovation? Maybe the image of the Coliseum is beyond repair even with a renovation. Maybe the fact that the field is 20 feet below sea level makes it a bad choice for forward-thinking CEQA guidelines about sea-level rise or storm-related flooding. Neither of those is a good excuse. If everyone involved in wanting to keep the Raiders (team, government, fans, investors) isn’t merely about playing games, there’s no reason why this kind of option wouldn’t be investigated thoroughly. It’s cost-effective, proven, and preserves the very site that so many Raiders fans hold dear. P.S. – While we’re at it, why didn’t the 49ers incorporate some of these amenities into Levi’s Stadium? We’ve already seen these put into arenas and some stadia over the past few years. P.P.S. – The Dolphins are applying for $50 million in sales tax revenues. A decision to provide that funding along with funding for other sports venues has been delayed by the Florida legislature. Even if that’s approved, Ross is funding $350 million of the project, a better ratio than most American stadia. At least Ross dropped the charade and got started on the project. This entry was posted in Football, News, Oakland, Owners. Bookmark the permalink. Which amenities are you referring to in reference to the 49ers? Mini suites and such or something else? They’re a form of mini suites. You can see them in the video. Some are 4-person boxes called “living rooms” with multiple TVs. I was surprised when the final bowl layout was revealed that the lower bowl at Levi’s had no field suites. And I think the belief regarding the Coliseum, rightly or wrongly, is that a nearly 50 year old multipurpose stadium is beyond saving. Otherwise we might have seen the old multipurpose stadiums in places like Philadelphia, Pittsburgh, DC, etc heavily renovated/modernized to be football-only or baseball-only and then just build a new corresponding ballpark or football stadium instead of 2 new stadiums. But I can’t think of anywhere where that has happened. I believe Philly and Pittsburgh were done on the public dime and DC with deep-pocketed owners, meaning those teams didn’t have the same cost pressures to at least consider a reno. This is the project where Ross asked for tax revenues and said it would be needed if Miami was ever to get another Super Bowl. The request never got a vote in the Fla. legislature and the NFL went and awarded Super Bowls to a couple of different cities, including, what was that place again with the stadium named after the pants company? Ross ended up doing for the work himself, under the condition that he would get multimillion-dollar grants for every Super Bowl or other Big Time Sporting Event awarded to Miami afterward. The departure of the Marlins enables the reconfiguration of the stadium. Coliseum renovation OR new 3/4 stadium built around Mt. Davis? Perhaps “renovation” conjures up images of lipstick on a pig, thus why no one ever brings it up (?). Complete demolition of the old bowl and building NEW around a refurbished Mt. Davis is the way to go. Nice job in Miami BTW! I agree with you that would be the most practical thing. Mount Davis is only 20 years old, but I’m not sure Mark would go for that. He seems pretty insistent on having something new. Yes, and Miami did do a nice job. I think Mark Davis would consider a partial rebuild/renovation of the Coliseum as Tony D. has so described. There should be significant cost savings in building such a structure, as opposed to building an entirely new stadium. Thinking along these lines, a long-term deal to keep the Raiders at the Coliseum site could still be worked out. BTW, the canopy design at Dolphins Stadium should be applied at Levi’s Stadium, at least on a smaller scale. The roof in Miami can’t even come close to being applied to Levi’s. Levi’s design in fundamentally at odds with roof construction. If the A’s renovated at the Coliseum could they reorient their field and use Mt. Davis along the 1st base line? Just spitballin’….oops, maybe wrong term to use. If anything, it would be the third base line so the field would face east rather than west. However, those seats would have the setting sun right in the fans’ faces for night games, the club deck is too far away for a baseball stadium, and the upper deck is too high and far away for baseball. so there’s my answer to the question i threw out there a couple of times here in reference to any kind of roof the niners could have for levis stadium on whether a football venue could down the road eventually build some sort of roof over it. obviously this was mia’s plan all along to build a roof one year year later and for levis stadium it’d be a huge drastic move to build such a structure over the stadium that they didn’t plan for which in all likelihood won’t ever happen. Levi’s design doesn’t really lend itself to the addition of a roof later. Nor does it need one. Good to hear. Was there a response? Agree. Hopefully the powers that be (Davis, Kephart, Miley, Schaaf, etc) will consider a Coliseum redo. Who exactly in the “Twitter verse” didn’t like the idea? I have yet to see anyone in this forum who thinks its a bad idea. Mixed, most of the people felt that would be the red herring the A’s would need to pressure MLB to move to the South Bay. Man, as much as I want the A’s to stay in Oakland, I must say this idea of Wolff’s (parking spaces), is not ideal for Oakland. I guess I was one of the person’s saying it could be done another way. Is there any doubt that If, if, if, the Raiders and New City can get things done with a development component, the city of Oakland should go with them and only go with Wolff and the A’s as a backup plan? This renovation move alone will get Miami back in the NFL Superbowl rotaion as it should be.